Dr. Dimitrina Petrova is a Bulgarian human rights activist and Program Director of SOS Children’s Villages. From 2007 to 2016, she was executive director of the Equal Rights Trust, a London-based NGO she formed to promote a holistic approach to nondiscrimination and equality worldwide. Following a career in Bulgarian politics after the collapse of communism, she has dedicated much of her efforts to defending the rights of East-Central Europe’s Roma minority through her role as director of the Human Rights Project and later, as founder and executive director of the European Roma Rights Centre in Budapest. 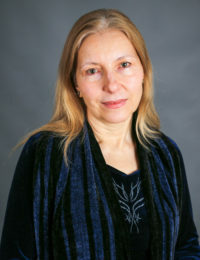 Dr. Petrova has taught at the College of Europe in Warsaw and Central European University in Budapest and has consulted extensively on minority rights and discrimination issues for organizations such as the World Bank, Human Rights Watch, and the UN Office of the High Commissioner on Human Rights. During her fellowship, she devised new strategies for civic activism in East-Central Europe that better suit current geopolitical realities and antidemocratic trends in the region. The International Forum for Democratic Studies asked five leading experts for their views on the root cause of rising illiberalism in Central and Eastern Europe. Read Dimitrina’s views.